The WebWise survey was conducted across schools in 13 cities of India covering a sample size of 2727 students who have attended these sessions. The WebWise programme is aimed at strengthening digital resiliency among school children. As part of the programme, Telenor employees conduct workshops in schools to spread awareness on safe internet practices for students, teachers and parents. The Telenor India WebWise report indicates that children are extremely vulnerable to account hacking, receiving inappropriate messages, being bullied online, etc. Cyber-bullying has also emerged as one of the major threats online and often it goes undetected as children do not discuss the issue with parents or teachers. · Children use internet to find information for school projects, playing games, reading online books, listening to music and watching movies, social networking sites, email, etc. · Over 35% children have experienced their account being hacked while 15.74% shared that they have received inappropriate messages. After the workshop, 92.6% of the children surveyed said they will not share personal information with strangers while online whereas 89.3% said they will block suspicious persons and inform an adult in case they are bullied online. In 2014, a Boston Consulting Group (BCG) study done on behalf of the Telenor Group indicated that nearly 180 million children will access internet by 2017 in Telenor markets (13 countries) and up to 85% will use mobile devices as their point of access. Amongst the 12 countries studied by BCG, children in India were in the highest risk category due to a combination of increased access, enabled by affordable Internet and smartphones, and lack of knowledge among parents and children on the safeguards against different types of cyber threats. 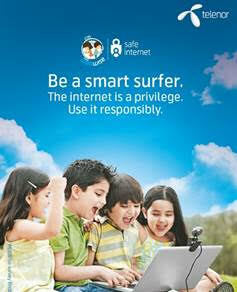 To mitigate these risks, Telenor has been consistently working towards making Internet use safe among children. It is extremely important for a parent to monitor the online activities of their children and constantly educate them on internet safety by citing real life examples. Earlier this year, Telenor had also launched a Parental Guide to help parents talk to their children about internet access and solve their existing dilemmas.